The beauty of a stained glass piece, as with any art object, is a matter of personal taste. While you can hunt for and possibly find an off-the-shelf item that you like, why not have a piece designed to fit not only your personal tastes, but the exact space you have in mind? Karla has been designing and building in stained glass for well over 20 years. She has built windows and doors in every size from the smallest cabinet door insert to windows covering dozens of square feet. She’s created these in many different styles from historic Victorian and Arts & Crafts to Contemporary Abstract. From the beginning, Karla loved making pieces that had special meaning for others. She has turned this into a great skill – she is expert in drawing out your ideas and turning them into a design you’ll love. Interview: Karla typically starts by having you tell her about the piece you are interested in. Among the interview topics are: The size and placement of the piece, the style of the room where it will reside, what colors and styles you favor, and your rough budget. This all gives her an understanding of your situation and informs the next steps. Gather Ideas: Karla will then work with you to find images that are attractive to you. These can be from pictures you have, one of our dozens of pattern books, or something found online. For instance, if you like a particular style such as “Frank Lloyd Wright,” she’ll have you look at several existing examples and discuss which designs and details you like and which you don’t. This will give Karla a further understanding of what design features you’ll really love. Preliminary Design: Once Karla has all this input, she’ll develop a few preliminary designs – these will typically be quick renderings roughly to scale. She’ll confer with you to get your feedback on the designs. At this point, we’ll do detailed estimates of each design’s costs. Final Design and Glass Selection: After one or more rounds of preliminary design, you and Karla will have selected and refined the final design. At this stage, Karla will typically meet with you to pick the exact types and colors of glass for use in the window. She’ll have specific recommendations, but will ask for your opinions to again ensure that you really like each choice. Once these selections are made, Karla will provide you with a full scale rendering and a formal quote for the design you have built together. When this process is complete, your window will be scheduled for production in our Lexington, Virginia studio. We also enjoy working with design professionals. If you have a finished design, we can quickly import it into our specialized glass CAD system and give you a fast quote. Karla can provide advice at any design stage and we can work with you and your customer however you prefer. 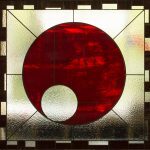 If you are considering a custom stained glass project, you will obviously need to understand the likely cost. As in many other things, the cost of a stained glass project is proportional to its complexity. 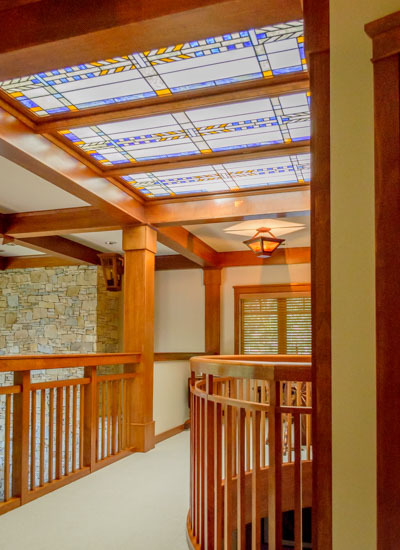 Below are some of the key variables that drive the cost of a stained glass design window. Karla will work with you to create a design that uses these variables to meet your budget. Window size – the larger the project, the more materials are required. Number of pieces – since each piece takes labor to create, more pieces means more cost. Size and shape of pieces – generally smaller pieces with more curves cost more to make. Glass type – Opaque or heavily textured glasses are significantly more difficult (require more labor) to cut to shape. Glass manufacturer – there is a wide range of glass colors and types, and their costs vary greatly. Bottom Line: a stained glass window can be as little as $75 per square foot or as much as $1000 per square foot. The actual cost of your project will depend on many variables – but we’d be happy to give you an estimate! You can see some of Karla’s custom work in our Stained Glass Portfolio. You can read more about Stained Glass and how it’s made in our Techniques essays. 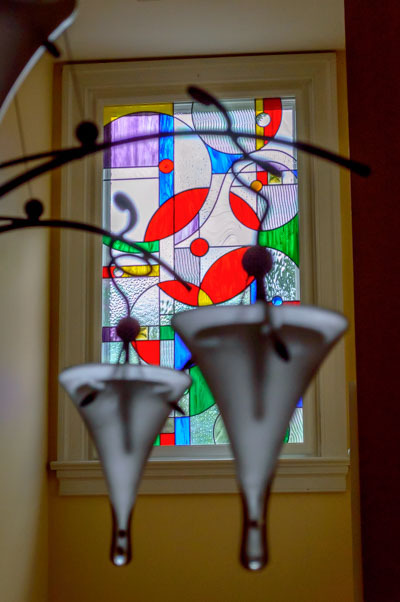 If you are ready to discuss your design or just have a question about our custom stained glass, please contact us using the form below, or call us at (540) 521-6128. We would love to work with you on your project!